The Hoosiers moved up to No. 7 in the country this week – but should they be ranked even higher? 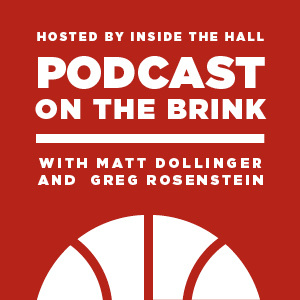 Inside The Hall editor Alex Bozich joins Matt Dollinger and Greg Rosenstein on Podcast On the Brink to discuss Indiana’s position in the top 25 rankings and weigh-in on where the team stands in the Big Ten. The three also breakdown IU’s road victory against Penn State and discuss what challenges the Hoosiers could face the rest of the season. They also preview Indiana’s home game against Minnesota on Thursday and the matchup between Cody Zeller and Ralph Sampson III. With the Hoosiers at 15-1 and at their season’s midway point, the group hands out awards to the best and worst of the first half. And at the end of the show, Bozich and Rosenstein square off in a battle of wits – answering IU trivia questions to settle their long-standing, bitter rivalry once and for all. So tune in and enjoy. As always feel free to drop us a note at [email protected]. We’ll be back later this week after the Minnesota game. Great podcast! One thing you guys could improve, perhaps: use a little more inflection in your voices. The tendency towards monotone makes the very insightful things you are saying come off as mildly soporific. Keep up the good work! Love this blog and this team. been a Hoosier fan for 40 years. I love them. I do not, however, think this year’s squad is a Top 10 team – yet. Top 25 for sure, but #8 is a stretch. They should finish 24-7 or so and get a 3 or 4 seed. Music fixed! Bob Barker fail. Love the pod cast but I wanted to make a comment on the Penn State game. I love playing man to man defense but if a team like Penn State we could’ve tried a 2-3 zone to prevent the drive in the paint. Granted I know they did have somewhat in a presence outside with that 34 kid hitting some shots. I just like us to mix it up a little bit just to give some teams a different look. I mean we could’ve even played a 1-3-1 and forced them to baseline to make their shots. Sometimes you gotta give inexperienced teams different looks to shake their confidence and that’s what I kinda feel we needed to do when we were up by ten. Box and 1 woulda been pretty good to chase the one guy who could hit consistently, but one never knows how much we’ve practiced these defenses. that seems fair, just based on how they are playing and the schedule I do not see them having any losing streaks. I can see them linger around in the 12-20 range until the end of the year. Who should be in front of us? The polls represent where we currently stand compared to everyone else. The 4 teams that you think should be in front of us lost games that we haven’t. Winning games is what makes you a top 10 team, and that’s what we’ve done. I think sfm1956 is about spot on. As great as those wins were, they were at home. I’m not taking anything away from those victories, as nobody in the nation can touch that resume right now. However, he is projecting the rest of the season, and at 24-7 (or around there) the Hoosiers will probably be a 4 or 5 seed. There’s absolutely nothing wrong with that, as most people saw this as a NIT team before the Movement arrived. They’re capable of beating anyone, but if they’re going to stay in the top 10 they need to beat some good teams on the road. This Sunday will be very telling for expectations the rest of the way. Thank Buddha there are some objective, hoops-savvy fans out there! I think if they can keep evolving this season, there is no reason IU can’t finish in the top 10. CW is playing stellar. DE, VJ need to be more consistent and AE & RA need more PT for confidence & seasoning. A 4 or 5 loss record going into BG10 tourney is possible. I don’t think we have as much to worry about our defense, as some are saying. You have to take into account Roth and Hulls playing man for a good chunk of the game. A lot of the easy buckets toward the end were a product of being in foul trouble. Love the podcast. At this point in the season we lead the Big Ten in Field Goal percentage at 50.5% ( OSU is second) and we lead the nation in 3pt %age at 47.6 no one in the Big Ten is close and nationally mostly smaller schools are up there near us (Cal is an exception). Although we are near the bottom in points allowed we are 2nd to Wisc in not allowing many 3 pt shots. You also have to remember rankings reflect how teams in front of your perform as well. We shot up from 12 to 7 partly because of how the other teams in front of us played. Our Top 10 ranking is definitely inflated to some extent. I was happy with 12, which I felt was very realistic.